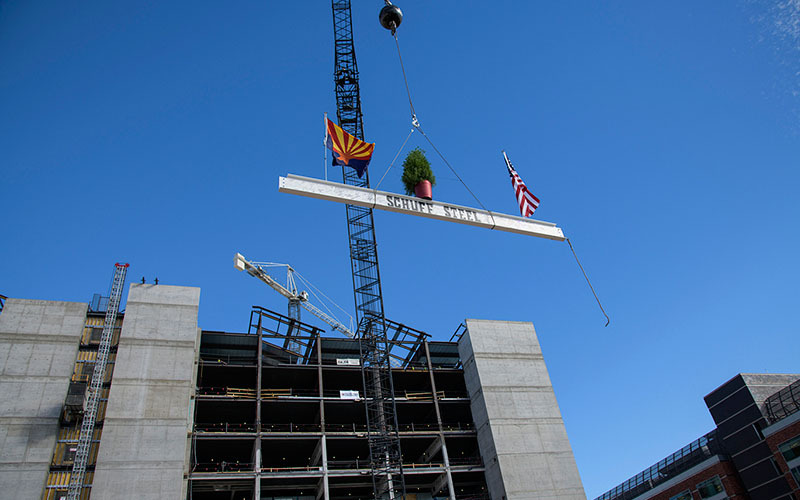 The commemorative last steel beam was put into place recently at the UofA Health Sciences Innovation Building (HSIB) project in Tucson, a world-class center designed to be the vanguard for inter-professional health education in the US. The $165 million facility broke ground in 2016. Designed by CO Architects with Tucson-based Swaim Architects, the 10-story, 220,000 square foot building is located on the west side of the Arizona Health Sciences Campus. The project is envisioned to foster collaboration among multidisciplinary teams of students and faculty in four colleges: medicine, nursing, pharmacy and public health. Classrooms can accommodate as many as 150 people in flexible “flipped classroom” format, which prioritizes group work over lectures. The building also includes a special events space that allows for more than 1,000 people. Martin, White & Griffis is working with affiliate office John A. Martin & Associates (JAMA) in Los Angeles and general contractor Kitchell on the project.